Where is KEC’s office located? KEC is located at 2451 W. Dakota Avenue in Hayden, Idaho. Directions: From Highway 95, turn west on Dakota (one block north of Hayden Avenue) KEC is three blocks down on the right side. From Highway 41, turn east on Hayden Avenue, go approximately four miles to Atlas and turn left. Go one block and turn right on Dakota. KEC is on the left side. What is KEC’s mailing address? Where can I get help paying my electric bill? Call KEC at 208.765.1200 for more information and other possible resources. The intent of the service availability charge is to cover a portion of the costs we incur to build and maintain the system that carries the electricity to your home or place of business. Even if no electricity is used, we still face these expenses in keeping the facilities in place to deliver energy. Those costs include substation and power line improvements, maintenance and repair, billing, accounting, the repayment of loans, and member service. What happens if I’m going to be away for an extended period of time? 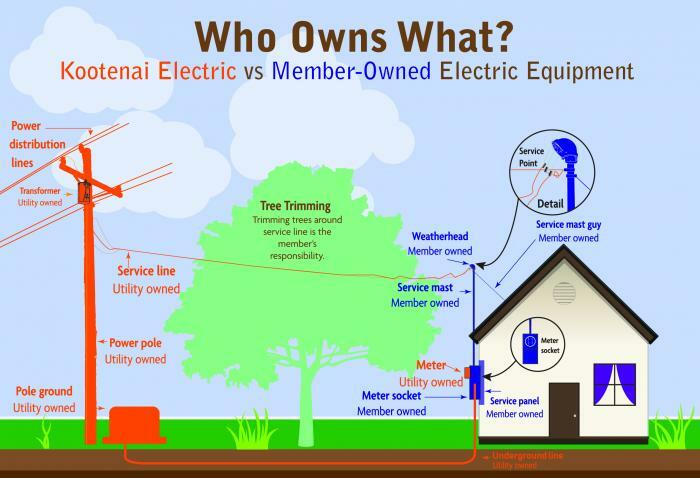 The electricity used in your home does not stop unless you turn the main breaker off or request to have the meter physically disconnected by KEC. If neither of these measures is taken, refrigerators, freezers, furnaces, baseboards and water heaters continue to operate. In order to prevent your electric service from being unnecessarily disconnected during an extended absence, contact our member service department before you leave to make payment arrangements. We will help you figure out how much you would need to pre-pay on your account or we will get your authorization to charge a MasterCard or Visa on a monthly basis. It is also a good idea to leave a number with KEC where you can be located in case of an emergency. If you are having problems paying your electric bill please call us. We will work with you as much as we can to help you resolve your problem. We disconnect power for non-payment only as a last resort. Generally, KEC is responsible for maintenance and repair of our facilities up to the electric meter. The member is responsible for the cost of repairs from the meter to the home. What if I'm on life support? If you or someone in your home uses life support equipment, Kootenai Electric needs to know. Please take the time to contact us. Part of our mission at Kootenai Electric is to provide members with reliable service, but there are times, due to the weather and acts of nature, when your service will be interrupted. While no one likes power outages, they can be especially worrisome to those with special medical needs. Power interruptions are usually infrequent and brief, but as we saw from the storms last winter, members need to be prepared for days without power. Sign up for KEC outage alerts. Log in to your account online or download the SmartHub app on your phone to stay connected with KEC. You can report power outages and electrical emergencies by calling 1.877.744.1055, using your online account or by using the SmartHub app. Always report a power outage or electrical emergency, don’t assume someone else will call. If you have a generator installed, please call us at 208.765.1200. For the safety of our employees and the public, we track where backup generators are installed. The Food and Drug Administration published Guidance on Home Use Devices,recommending that individuals dependent on a medical device establish a plan for responding to a power outage and maintain medical information, a list of emergency contacts, extra oxygen tanks, battery backups and contact information for transportation services. Below are some tips provided by ready.govto making a power outage plan for those who rely on electricity for medical needs. Plan alternative ways to charge your mobile devices, and communication and assistive technology devices before disaster strikes. Plan how you will address your dependence on electricity. Tell your power company if you use oxygen- or mechanical ventilation. Be very clear about what you can expect from them in a power outage. Before disaster strikes, you may register with your power company. They may alert you when power will be restored in an unplanned outage and before a planned outage. This is particularly important if you use oxygen or mechanical ventilation. If you cannot be without power, plan for how you will obtain power backup. If possible, have backup battery, generator, solar or alternate electrical resources. Explore newer solutions, and also consider foot pumps and other simple tools that might suffice when nothing else works. Charge devices that will maintain power to your equipment during electric outages. Purchase extra batteries for power wheelchairs or other battery-operated medical or assistive technology devices. Keep the batteries trickle charged at all times. Find out if you can charge your wheelchair or devices from a car or using rechargeable marine batteries. Make sure you assemble what you’ll need in advance. Backup chargers for a cell phone could include a hand-crank USB cell phone emergency charger, a solar charger, or a battery pack. Some weather radios have a built in hand crank charger. Backup chargers for a laptop or tablet could include a 12V USB adapter that plugs into a car, an inverter, or a battery jump pack with an USB port. Receive important information on a cell phone or smart phone. Sign up for emergency emails and text messages on your cell phone from your local government alert system. Plan how you are going to receive emergency information if you are unable to use a television, radio or computer. This may include having an adaptive weather alert system to alert you in the event of severe weather. What if I want my service disconnected? In cases where the requested disconnect is necessary for safety reasons, there will be no charge. In all other cases, a disconnect fee and reconnect fee of $75.00 each will be charged if the service is disconnected or reconnected during normal working hours. Services disconnected and reconnected within a 12-month period will also be billed the monthly Service Availability Charges applicable during the period of disconnection.